Goodnight Darth Vader is a bedtime story for the kids in your life both big and small. 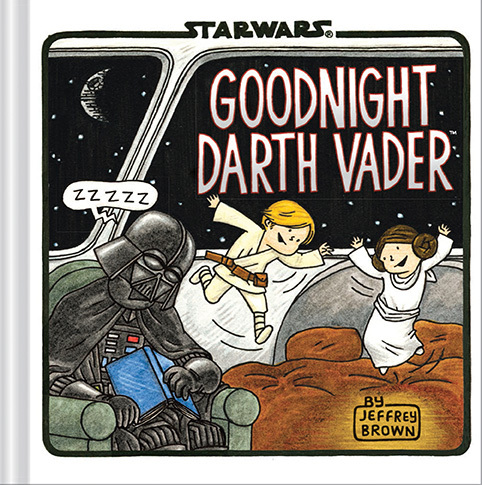 As a Star Wars nerd myself, I loved reading author Jeffrey Brown’s interpretation of the sleeping habits of our favorite characters. He pulls from not only the movies, but from the Clone Wars characters as well and a few rather obscure characters to all but the most ardent fan. Jocasta Nu anyone? Dianoga? Dexter Jettster? Of course, all of our favorites are in the book as well. Han, Chewie, Obi-Wan, Yoda, C3PO and R2D2 are all present and accounted for as are the Star Wars villains. The Emperor, General Grievous, and Darth Maul make their appearance. Even the Emperor goes to sleep with a teddy bear. 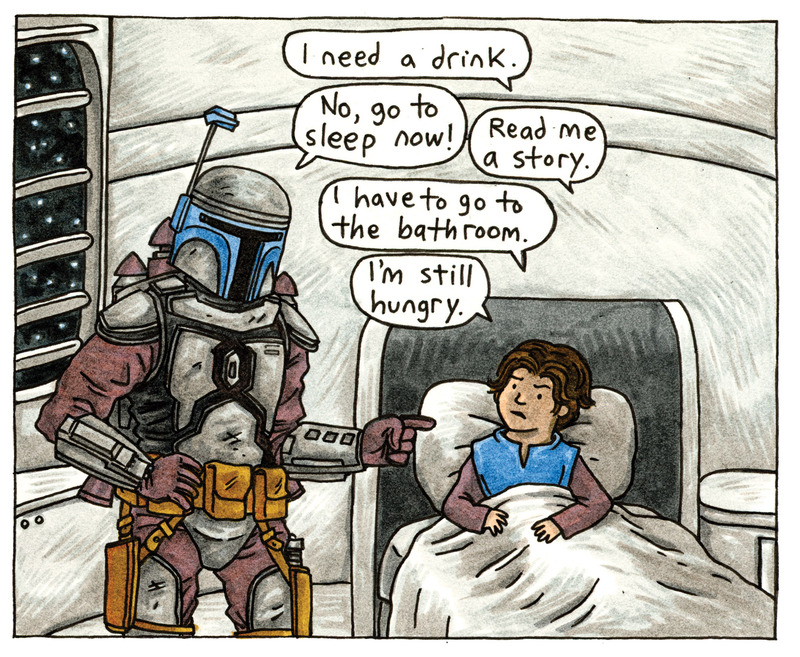 The interaction between Jango Fett and his son Boba Fett is funny if not reminiscent of most parent’s experience with their children at bedtime. Goodnight Darth Vader was written as a response to the two other Vader parenting books – Darth Vader and Son and his follow up bestseller Vader’s Little Princess. Jeffrey said he had people come up and tell him they had to read those books to their kids before bed every night. He thought to himself, “Those aren’t really meant to be storybooks for kids.” But he had so many who came up to him, he got the idea to write one specifically for parents to read to their kids at night. Goodnight Darth Vader is the product of that idea. An homage to the classic children’s book Goodnight Moon, Jeffrey’s take is both fun and unique. He incorporates his love of Star Wars into these books with details most readers would be unaware of. He uses quotes from the movies and changes them slightly to fit the story. My favorites were at the beginning when Vader tells young Luke and Leia, “Join me, and I will complete your bedtime,” and follows that up with “If only you knew the power of sleep…” This book is a must have for any parent who loves Star Wars. Next Next post: Disney Foodie Spotlight: Corner Cafe at Disneyland – Hot Dog Heaven!